The temporary relocation of Route 610 Stafford and Mine Road slug stations will remain at the Kiss and Ride area on N. Rotary Road during the Eads Street construction. Please pay close attention to traffic control direction, signage and traffic signals as they will change to align with the new traffic patterns. 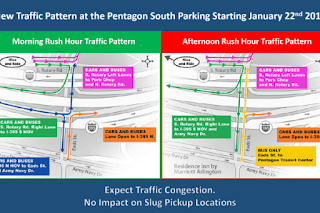 Download flyers for Morning and Afternoon traffic patterns. Visit https://www.expresslanes.com/projects/395 for more information.